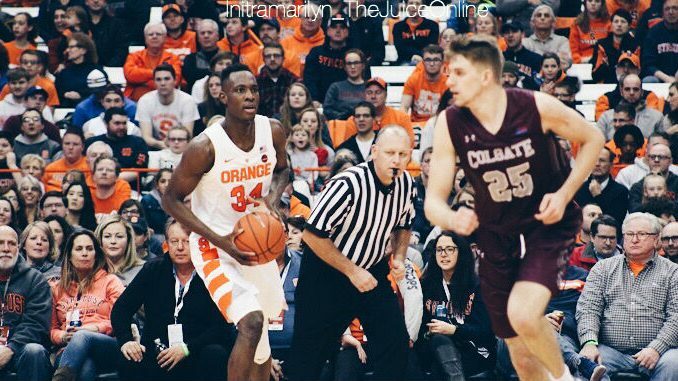 Syracuse center Bourama Sidibe (34) pulls down a rebound against Colgate. Mandatory Photo Credit: Initra Marilyn, The Juice Online. Howard Washington/Robert Braswell: Washington played three games, Braswell played 12. I hope both become productive players next season. Grade: INC.
For more Syracuse coverage, Like our Facebook page and follow us @TheJuiceOnline. Wes has worked for Rivals.com covering the New York Knicks, as well as for Scout.com covering Syracuse athletics. Wes has also worked for the South China Morning Post (Hong Kong) and reported on the NBA and MLB for the New York Sportscene. A native of Long Island, New York, Wes graduated from Syracuse University in 2005. Follow him on Twitter @ChengWes.